Since its inceptions in 1979 Indian Institute of Business Management Patna strives hard to achieve its aims and objectives with the help of prominent academicians, social thinkers Business planners and Government policy makers, Management Philosophers and Industrialists as an autonomous, non-profit making all India Institute by its activities like studies, training, research, conference organization, publications, consultancy and advocacy in the related areas. Work and sweat for a great vision, the vision of transforming India into a developed nation, powered by economic strength with a strong value system. 'Keep the lamp of knowledge burining to achieve the vision of a developed India. Establishment of an international network of centres of excellance for learning that supports the transformation of India into a compelling and dynamic nation, by attracting highly motivated professionals and entrepreneurs, facilitating the mobility of global talent and engaging them in value based productive, effective and innovative enterprise. Governmental Collaborations and financial support. 1. 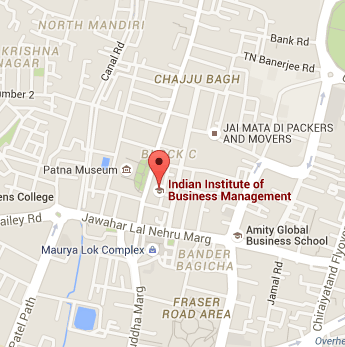 The Indian Institute of Business Management is registered under Indian Societies Registration Act of 1860 as a non-profit making, cultural, social, educational and technical society. 2. The Institute is exempted from Income Tax under section of Indian Income TaxAct. 3. The Institute is recognized by All India Council for Technical Education (AICTE), Ministry of HRD, Govt. of India since 1994 as equivalent to MBA degree. 4. The Institute has been recognized by Deptt. of HRD, Government of Bihar. 5. The Deptt. of Labour Resources, Govt. of Bihar has recognized the PG Diploma in Mgt. is equivalent to MA(LSW Degree) for the purposes of recruitment under factory welfare officers rule & regulations. 6. The IIBM Patna is also recognized by Deptt. of Science & Technology, Government of Bihar. 7. The Ministry of Communications and Information Technology, Govt. of India has sponsored and funded the institute for conducting the (a) Establishment of National Centre for Instructional Software Materials Development and Training (b) IT Awareness programme in the year 1984. 8. The Ministry of Communications and Information Technology, Govt. of India has funded & sponsered for introduction of PD Diploma in Computer Applications. 9. The Ministry of Industry, Government of India under Special Component Programme has candidates of Bihar & Jharkhand under entrepreneurship development programme. 10. The Ministry of HRD, Govt. of India and Directorate of Adult Education, Govt. of Bihar recognized and funded the institute for computerized evaluation and monitoring of more than one lakh adult and non-formal education centres in Bihar & Jharkhand. 11. The AICTE, ministry of HRD, Govt. of India tended the Institute to organize technical seminar & workshops on various management & Business themes and projects. 12. The Ministry of Environment, Govt. of India sponsored and funded the project related to Environment Management and pollution control.